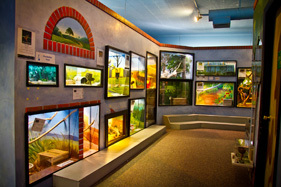 About seventy-five wild and domesticated animals live at the museum. The mission of the Lutz Children’s Museum shall be to provide a multi-faceted museum for children to explore culture, history, and the natural sciences through internal and external exhibits, programs, and experiences. The late Hazel Lutz was a beloved art teacher and also a world traveler. During her travels, she collected a variety of artifacts and trinkets that she believed would be of interest to children. Hoping to use these items as educational tools, she established a “museum” in the storage closet of her schoolroom. Her collection grew through the donations of others and began to include items that could be related to most academic disciplines. From her storage closet, the collection was moved to progressively larger and more public spaces. The Lutz Children’s Museum was founded by the PTA in 1953 and named in her honor. To this day, the museum offers children educational and cultural opportunities that they may not have otherwise and gives teachers an additional source of enrichment and resource materials.